Located at the northeastern periphery of the Corbett National Park on a clearing enclosed by dense deciduous forest, Camp Forktail Creek is a wonderful accommodation for camping in Corbett National Park. This slice of paradise is tucked on an area enclosed by dense Sal forests. To recreate the village like feel in this dense forest the huts are built with thatched roof and typical glass-wooden windows and doors. 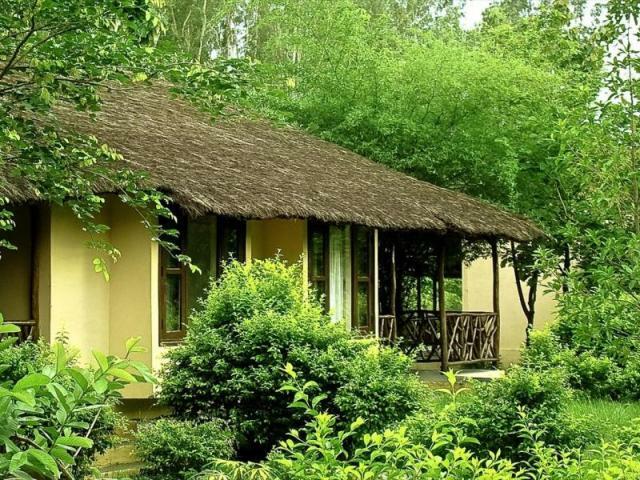 The rooms are surrounded by deep green vegetation and will let one witness the untainted scenic view of the forest. There are around 12 luxurious safari styled tents which are set on elevated wooden platforms. Each tent has a separate balcony to help you enjoy your private moments with nature without getting disturbed by the outsider’s intervention. The semi-tiled toilets are facilitated with cold running water where hot water can be served on demand. Instead of electricity oil lanterns are used as a source of lighting at night. There is a one stop dining and lounge area in the campsite premise known as Thatch – designed with locally available wood and grass where lighting is done with oil lantern. Devoid of every single element which is artificial and polluted, Camp Kyari is a newly built accommodation on the periphery of Corbett National Park. This peaceful accommodation is located in Siyat, a small Kumaoni village outside the park. The serenity imbibed in the natural ambiance of this accommodation is tough to beat by the usual luxury hotels of cities even. The experience gathered from a stay in these hut like accommodations is wild and real. Those who want to experiment with their stay and would love to go for something more adventurous, they can pitch tent into deeper forest to co-exist with diverse wildlife. The tents are developed in American Safari Tent style with mats and sleeping bags offering comfort even in the meadows. Cots and ground bedding can be arranged as per the need and requirement. Hygienic toilet tents with running water flushes. Sufficient kerosene/solar lanterns are used to light the campsite. The camp kitchen serves delicious varieties of Indian as well as continental cuisines. If one is looking for a retreat in the woods, Jungle Brook Camp Resort in Village Tera off Ramnagar should not be missed in any way. 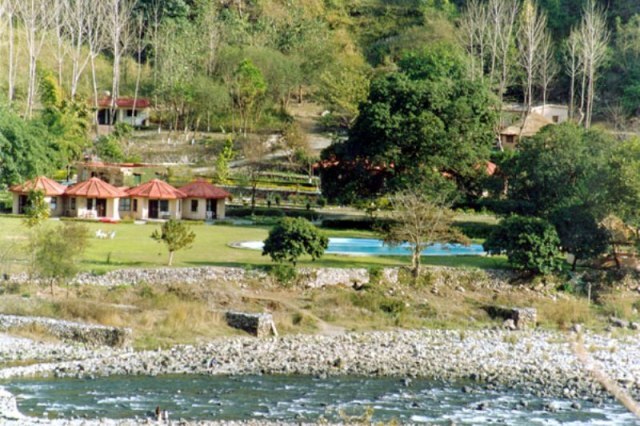 This resort is located atop a gentle crest set against a beautiful scenic view of the hills and with a riverbed on the other side. The rooms are built with thatched roofs on terrains carpeted with thick layers of green grass. The tents are developed in Meru and Zulu style that replicate the colonial hunting tents. The uniqueness of the Meru Tents lie in their open sit outs and bathrooms built in European style. Zulu is the name of the houses of African Tribes and thus these tents resemble the same style. The tents in Zulu style are made with a private courtyard for each along with a machan. The private restaurant of the resort serves delectable Indian, Chinese, Continental and a variety of local Kumaoni Cuisines. Located at the foothills of Shivalik on the banks of gurgling river Ramganga, this resort is a perfect vacation to escape from the scorching summer. This is a place where you can feel the charm of lavish stay enjoying the refreshing wild fragrance of chir pine, jamun or mahua. The exterior of the accommodations are specially designed to create the tent like look. The tented accommodations are mainly divided into two categories such as air cooled and air conditioned Deluxe Swiss Cottage Tent. These tent-like accommodations offer all possible modern facilities to give them a home like feel. 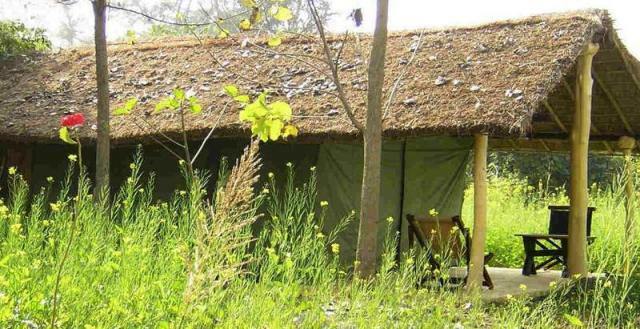 The accommodations of Deluxe Safari Tent category are built in hut shape with thatched roof. Running hot and cold water facilities connected to each washroom. Attached sit out opens towards enchanting views of the rich greenery. Located at a walking distance from Bijrani/Aamdanda Gate Corbett, Jungle Lore is an absolutely peaceful accommodation in Corbett where greenery splashes in dark colours. This camping accommodation is built on the theme of Indian Cottage and leaves a melancholic feel of staying in typical camps set during adventure tours. 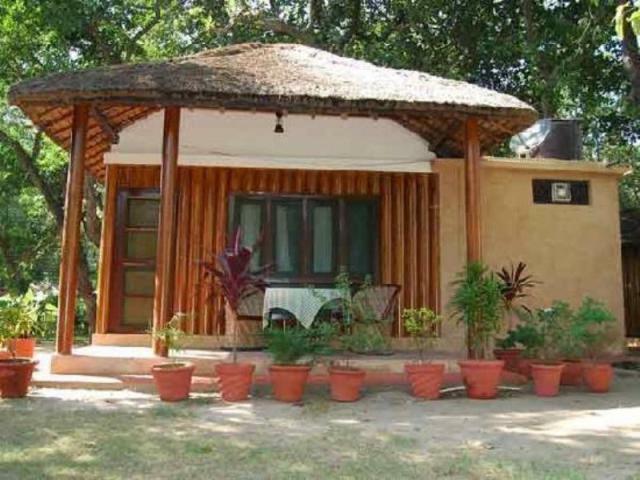 7 spacious triple bedded cozy bamboo cottage huts, 7 Dlx. Twin bedded tents have an attached bathroom/toilet, 14 normal triple bedded tents and 2 Jumbo eight bedded Tents. More than just a simple resort for overnight stay, Jim’s Jungle Retreat is one of the better luxury camps to stay in Corbett during relaxing vacations. 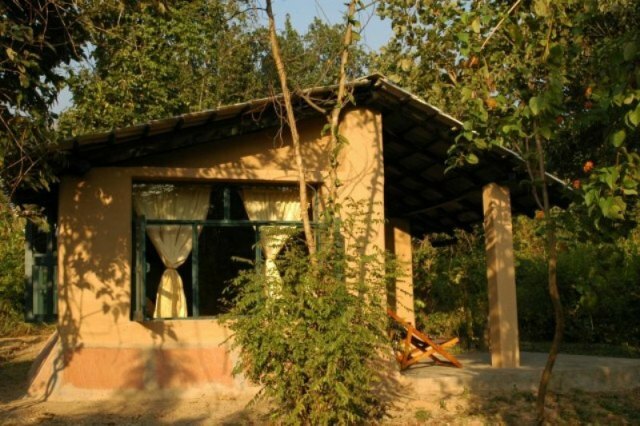 Strategically built amidst impressive natural scenario with picturesque Himalayan landscape at the background this camp is located in the periphery of Corbett National Park. To generate natural feel 12 cottages are built with thatched roofs while their surrounding comprises shrubs and giant trees. The lodge comprises 23 residences divided into three types i.e., safari tents, jungle cottages and lodges which are built taking inspiration from the old forest bungalows and safari tents. Apart from offering basic amenities like running hot and cold water supply and shower, the rooms are also equipped with television, refrigerator, study table and other required things for daily usage. Enjoy delectable dishes in their multi-cuisine restaurant witnessing the stunning natural view of the river and the wild. Intercom facility connects each room. Rappelling, angling and rafting can be organized on request. The popular campsites around Corbett National Park boost different designs which are certainly distinctive from the normal staying options. Most of them are set up with temporary outlook, but once you get inside, they are not less than any luxury accommodation. From June mid to October the monsoon prevails in Corbett and most of the muddy road becomes tough to access. So, except Jhirna all other zones in Corbett remains closed during this season. Novemeber to June is regarded as the best time for camping in Corbett. 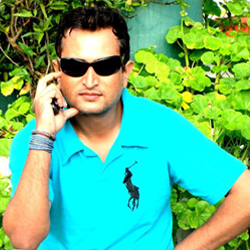 However, apart from the above mentioned accommodations there is scarcity of ideal camping sites in Corbett. Thus it is advisable to book your required space in advance so that you can avoid the last moment’s hassles and experience an unforgettable retreat this vacation with your close ones.